We parents would like to remind our readers of two important dates, one being today -- June 30, wherein several of D181 administrative contracts expire and we will permanently part with these administrators. This date is significant because it allows greater freedom for Superintendent White to now hire experienced and competent administrators to possibly fill these positions. New contracts typically begin on July 1. Assistant Superintendent of Human Resources: Dr. White has already announced a replacement for Doug Eccarius, who will be greatly missed. We appreciate his hard work and dedication to D181 throughout the years, and we wish him the best of luck in his new district. Perhaps one day down the road, he will return to us as an experienced Superintendent. Director of Special Education: Now that Christine Igoe is moving on, there should be BOE discussion as to whether Ms Igoe’s position is really necessary. She basically ran Special Education services, and as multiple parents have commented on this blog, she was challenging to deal with regarding Special Education and as a foot solider while promoting Learning for All mantras. Kurt Schneider was originally hired to run the Special Education Department before he morphed himself into a Learning-For-All-Curriculum-And-Instructional Expert. He alone can oversee Special Education services and we should use Ms Igoe’s salary to directly enhance the instruction of our children. Assistant Superintendent of Learning: It’s no secret Kevin Russell has had aspirations of moving up the organizational chart since his first days with the district. He was a good principal of Walker, one of the smallest schools in D181. We would like to extend our best wishes to him as he departs. And Mr. er, (taxpayer-funded Dr.) Russell, as one of the architects and promoters of Learning for All, consider yourself fortunate that you now will have a fresh crop of subjects in your new district for your experiment. Those of us who sat across from you in RtI meetings where you seemed to be listening and taking notes feverishly, never saw the instructional plan our children were promised. Best of luck to you as superintendent. We look forward to July 1 and beyond with the hope that Dr. White will seek the best candidates for the central office, and we are optimistic our district will improve and move ahead in a positive direction with a solid administrative team. No need for us to post a summary of last night's meeting. Dr. White quickly sent out the following email to parents and community members right after the meeting. Thank you Dr. White. We look foward to reading his full meeting summary, but appreciate his emailing everyone directly with news of what was approved by the board on the closed personnel consent agenda and posting a link. I am writing to provide a brief update following this evening’s Board of Education meeting. First, I invite you to join in congratulating a number of new employees who have been hired in the District. Included in the unanimously approved personnel agenda, Mr. John Munch for the Assistant Superintendent of Human Resources position and Mr. Michael Vilendrer for the Facilities Coordinator position, both effective July 1. Attached is a press release with more information about these incoming administrators. You can see the complete personnel agenda on BoardDocs. We look forward to welcoming each of the new members of our District team! Also, I invite you to review my Superintendent’s Report and the administrative team’s 2013-14 Year-End Report, both posted on BoardDocs with tonight’s meeting. My Superintendent’s Report highlights a variety of work currently occurring in the District, while the Year-End Report is an overview of our progress toward achieving the 2013-14 LIFE Goals. Please visit BoardDocs to access all of the meeting’s files, and watch for the Board Summary to be posted later this week. "Last night I made a public comment which has upset one of the board members I referenced. For that I apologize. My intention in making my public comment was to ask the full board to acknowledge their open governance violations and participate in additional training to further their understanding of the Open Meetings Act, Freedom of Information Act and board policies. To support my requests, I criticized the board for their actions during the October 17, 2013 executive session that was ruled to have been a violation of the Open Meetings Act. 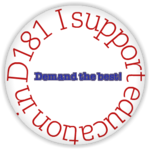 After receiving the ruling from the Attorney General's office, I contacted the full board and requested a copy of the audiotape and for them to post it on the D181 website along with all other podcasts of open meetings. It took a full week for the board to post the podcast, only after which I received a short email from an administrative assistant informing me of the posting. I had hoped they would -- as a full board -- be willing to engage in a constructive public discussion about the ruling and decide as a group if they wanted further training. Unfortunately, they chose not to schedule a discussion of this important ruling on the 6/23/14 meeting agenda. In my opinion it is important for a public body found in violation of open governance laws to discuss the issues. It is very frustrating that the BOE did not want to do so, or that their Board President (who sets the agenda with the administration) may have made that decision alone. As always, I believe its in the best interests of the community for the board to willingly comply with all open governance laws and to conduct their meetings and make all of their decisions within the guidelines of the existing laws and board policies." This afternoon we received the following comment from community member and former D181 BOE member Yvonne Mayer. She asked that we not publish it until after the public comment portion of tonight's BOE meeting, and then either publish it as a comment or as a free standing post. Because we believe the points she raises are valid and on point, we are publishing this as a free standing post. We thank Yvonne Mayer, and all other parents who show the courage to continue to publicly advocate on behalf of the public -- D181 parents. all taxpayers, students and teachers. The district is a better place because of your efforts. Yvonne Mayer's Public Comment removed at her request. Parent Jill Quinones has submitted via comment the following letter she sent tonight to Dr. Schuster, the Board of Education, Dr. White and various principals. She also stated it can be published as a stand alone post. Because it is such a powerful message, we felt it warranted publication as a stand alone post. I don’t know whether you are still receiving D181 email, but my comments here are equally relevant to some of your Administration and the BOE, so I am sending it to them as well. I also would like Dr. White aware of what has transpired so he can make it a top priority to make sure future processes are carried out with more integrity. First, let me assure you that while my concerns are an outgrowth of the “process” used to select candidates for the Superintendent’s Learning Committee, this is not about not being included on that Committee. It actually never was my intention to apply for that Committee. Ms. Garg contacted me on the day applications were first due asking if I would consider it. I already have 25 hours of things to do in a 24-hour day, but as always, I would have gladly done my part if I had been chosen. I have no issue with any of the parents that were chosen – I am sure they will work tirelessly. However, the “process” was flawed from the beginning when you extended the deadline despite having received by your first deadline more than enough applications from extremely talented people from every school except Elm. The fact that you or some of your administrators didn’t like some of the people who applied did not justify extending the deadline. Obviously enough people knew of the first deadline given that more than you were looking for applied. The flawed process became unsupportable when you created your own secretive pre-screening and gave no thought to the resulting defamation. I don’t know whether to call it ironic or disingenuous that you would set up criteria to prescreen applicants as possible bullies of teachers when not that long ago you personally (together with BOE Members) witnessed a then-BOE member of the community commit an assault and battery against another BOE member and rather than condemn the behavior you rewarded it by appointing that person to a District Committee. It seems to me at a minimum you pick and choose when to apply your own rules. Your actions suggest that your desire to keep bullies out of all aspects of the District only applies when it supports your purpose. And again, either ironic or disingenuous – but certainly inconsistent – is your application of Board Policy 8:030. You have championed this Policy when it suits your purpose. Although it is entitled ”Visitors to and Conduct on School Property” you have on at least one occasion that I know of decided it applies to e-mails from parents as well. So, if any of the alleged teacher bullying happened either in person or through e-mail, shouldn’t this Policy have kicked in? Shouldn’t the “bully” have been notified of his/her misconduct and been given a chance to respond and/or request the hearing referenced in the Policy preferably at the time of the incident, but certainly before being excluded from consideration for a committee? It seems to have become standard practice recently in this District (for those of us who have been around a while it has not always been this way) that when you, some of your Administrators, or even some BOE members are challenged on your Professional opinions, philosophies, conclusions, or practices that you, the Administrator, and/or BOE member respond by attacking not the critic’s opinion, philosophy, conclusion or practice, but by attacking the critic Personally. I have witnessed it happen by Administrators and/or BOE members to other Administrators and/or BOE Members, to teachers, and to parents. At a recent BOE meeting the teachers even expressed, "We do not want to be labeled as negative or complaining or questioning authority, but we do want to ask questions, get clarification, and offer suggestions." I have heard about (but not witnessed) other occasions where the parent was on the receiving end of a personal attack by an Administrator or BOE Member, and now, apparently, I have been on the receiving end myself. I just don’t understand why teacher, parental or Board Member questioning or criticism of educational philosophies, decisions, etc. cannot be responded to with respect for the person while disagreeing with the message. How can you not consider these personal attacks to be bullying? We have now received from Ms. Quinones links to the District's Responses to the Freedom of Information Act request she submitted regarding the Superintendent's Learning Committee. She asked that in the interest of full transparency, that we provide the community access to these documents. This evening we received the following information and chart from D181 Parent, Community Member and Taxpayer, Jill Quinones. She submitted it via the comments page. She requested that we publish it as a stand alone post, and copy the chart from a link she included. After reading through the content, we agree that the entire community should be made aware of the information she shared with the blog because in our opinion, it establishes that the artificially extended deadlines, incomplete applications, and behind the scenes decision making all tainted the process and the good intent of those who were selected. "Today I received the response to a FOIA I filed about the Superintendent’s Learning Committee process. I asked for the Applications and supporting material. I also asked for emails regarding the process. Being the data junkie I am, I prepared a chart. It was very easy to see who applied by the first deadline as the application was modified after that deadline to say that the deadline had been extended. 29 people applied in total – 26 parents and 3 community members. 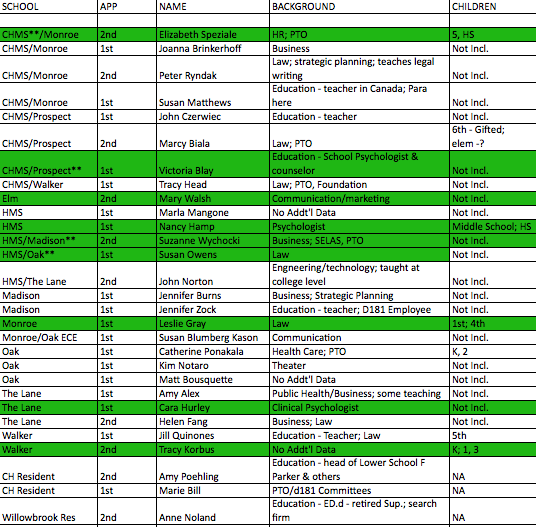 19 people applied by the 1st deadline, with more than one representing every school except Elm. No one applied from Elm by the 1st deadline although one person who applied as an HMS parent previously had children at Elm. 10 additional people applied by the second deadline. Of the 4 people chosen who missed the 1st deadline, there were 2-4 other parents who had timely applied from CHMS, Madison & Walker. Guess Administration didn't like the choices! As noted above, no one timely applied from Elm. Of the 9 parents selected, 3 are psychologists, 2 are lawyers, 2 have business / communication/ marketing backgrounds, 1 has an HR background and 1 is a PTO President, but no other information was included with her application. The Mission Statement for this Committee states in part that the members will "share relevant professional experiences... in the areas of curriculum, assessment, instruction and student services." As a result of this sharing, recommendations may or may not be taken to the BOE. Six (6) of the applicants, including 4 who applied by the 1st deadline, had curriculum backgrounds – NONE were selected. Not enough information included with most applications to conclude whether grades and ability levels of children are diverse among those selected. Even more interesting were some of the comments in the emails suggesting (1) before the selection committee met, at least two parents were weeded out of the applicant process based on allegations that they bully teachers, although no evidence of this was included in the materials I was provided, (2) at least one principal was asked to bring forth the name of whom he wanted to be the parent representing his school (so much for the committee selection process), and (3) while some parents submitted detailed applications, at least one who was selected provided nothing but their name and address. Now while I am sure those selected are committed, eager, and will work their hardest to represent all of the children, the way the Administration handled this process is particularly disturbing." "The Hinsdale-Clarendon Hills Elementary District 181 Board violated the Open Meetings Act Oct. 17 by holding a closed session discussion not authorized by any exception to the general requirement that public bodies openly conduct business, the Attorney General’s Office ruled. The decision by the public access counselor resulted from a request for review filed Dec. 5 by former board member Yvonne Mayer, who alleged the board improperly discussed her request for a report on her claim she was assaulted during an April 22, 2013, closed session by a fellow board member. Mayer requested the fellow board member be removed from the district’s Finance Committee following the alleged incident. “In my opinion, it’s all about being fully transparent and pursuing appropriate open government standards,” said Mayer, who served on the board from May 2009 through April 2013. The board was directed to release the portions of the closed session minutes and closed session verbatim recording that reflect the board’s discussion of Mayer’s request and its response. ....Based on the findings, the board was directed to release the portions of the closed session minutes and closed session verbatim recording that reflect the board’s discussion. Mayer said she believes the board should now put the verbatim recording on its Web site along with the podcasts of all open sessions that are available for public hearing." 1. It is very difficult to trust the BOE or past administrators when they violate the very laws that the Illinois legislators enacted to ensure open government and transparency. 2. When the BOE thinks it is appropriate to violate the Open Meetings Act, and force a respected community member to file a complaint with the Public Access Counselors Office of the Attorney General's office in order to ensure that justice is served, it proves that something is very wrong with the public officials we elected to represent our interests. 3. It would be interesting to know how much taxpayer money was wasted on attorneys fees by the BOE to unsuccessfully oppose Ms. Mayer's Open Meetings Act complaint. We challenge the administration to release this information to the public. Will the BOE comply with the directive that it release the verbatim recording of the executive session discussion that was in violation of the Open Meetings Act? Will the BOE learn anything from this ruling and will any of the seven board members suggest that the full board participate in a public educational session on Open Meetings Act Compliance? What will Dr. White say about this ruling, if anything? We believe based upon what he accomplished in his former district, that he is a "transparency advocate." This is his chance to take a public stand and publicly encourage the board to participate in Open Meetings Act training beyond the online training that all seven board members were already required to complete, but which obviously was not enough. We challenge even one board member to insist that additional OMA training be scheduled during an upcoming board meeting and invite the Attorney General's Public Access Counselor to conduct it. Last Friday, Dr. White emailed parents who had applied to serve on the Superintendent's Learning Committee. Nine of 28 parents who applied for the position received good news. The rest learned they had not been selected. A link to the D181 Website was included in the letter that lists the names of the parents, board members and central administrators who were selected, as well as information on the purpose of the committee. Names of principals and teachers who will serve on the committee have not yet been released to the public. -- It is ironic that Board Member Yaeger is serving on this committee instead of Mr. Heneghan who we believe previously expressed an interest in serving on it. Mr. Yaeger currently serves on the Finance Committee and everyone is well aware of his poor attendance record in serving on that one. If Mr. Yaeger intends to attend 100% of these meetings, then by all means, he should stay on the committee. But if he is not going to make this committee a priority, then he should step off now before it begins its important work. -- We recognize the names of several individuals who have been appointed to the committee. We want to recognize two of them and commend the administration for selecting Leslie Gray and Susan Owens, who have shown a real awareness of the curriculum issues over the last couple of years. They have been vocal advocates for all of our children and critics (at times) of the work done by the Central Administration and the Learning for All Plan. We know they will be committed to ensuring that the recommendations that the Learning Committee makes are reasoned, data driven and will not cause further harm to our students, but hope that they will not hesitate to speak out publicly in opposition if they believe the best interests of all students are not being met by the committee. -- We also are aware of the names of over five community members (who we will not name publicly) who applied to serve on this committee in a timely manner. They submitted their application by the first deadline and are all qualified to serve on the committee. Moreover, they represented multiple schools in the district -- Walker, Prospect, Oak, Lane, Madison, CHMS. They have attended board meetings on a regular basis, have made public comments or submitted letters and research to the board and administration to back up concerns they have raised over the last two years regarding the Learning for All Plan. At least two of these parents are former or current teachers (from other school districts). They have been actively involved in PTO committees at their schools either currently or in the past and they are all highly respected. YET THEY WERE ALL REJECTED FROM SERVING ON THIS COMMITTEE. -- We do not know how many of the "chosen" parents submitted their applications prior to the initial deadline set by Dr. Schuster, but we do know that the parents we reference above all did and would have fulfilled their obligations and duty to serve on this committee in a fair, informed and committed fashion, would have each represented a different school, and yet the administration turned them all down and kept extending the deadline until there was a larger pool of applicants. The extensions of time to submit applications were unfair to these parents who not only have proven their commitment in the past to all of the D181 students, but jumped through all of the necessary hoops to serve on this committee and did so without prodding from the administration after the initial deadline was extended. We are not criticizing any of the parents who have been selected because they too submitted applications (and some may have before the first deadline was extended), and we assume they would not have done so if they didn't have a real interest in serving. But we do criticize the administration because based upon their rejection of parents that they or certain BOE members have characterized as "naysayers," it makes us question when the applications of the appointees were received, and whether anyone from the administration contacted them and asked them to submit applications. We are sure we will never know the answer to the latter question, but if the administration wants to be transparent, it should release the names of the 28 applicants and the dates when they submitted their applications. It should also release the applications they submitted so the community will know their backgrounds and qualifications to serve on this committee. The administration should also release the names/schools of the teachers and principals who will be on the committee. It is concerning that their names have not been identified yet. While they may not be allowed to participate in the committee meetings, any parent, including those who applied and were not selected, should also be allowed to attend and "observe" the committee meetings, in order to stay informed as to the work it is doing. Or, as an alternative, the committee meetings should be videotaped as are all committee meetings at the high school district -- D86, or audio-taped, and posted on the D181 website. If Dr. White wants to be completely transparent and regain the trust he may have already lost from some of the disappointed parents, he should allow one of these options, since after all, this is a SUPERINTENDENT'S committee and he can "make the rules." Hopefully not a tarnish on the great start, but decisions on who was selected for Superintendent Learning Committee went out today. I was not selected, but would be curious of anyone else who read the blog was or knows someone who was. The letter, of course, did not list who comprises the Committee - so much for transparency. No nod for me either. Heard from another high informed, well qualified parent that she was not selected. My theory is that parents who were chosen have children affected by the math pilot. I was not selected either. If this is the case, then the email should have stated this. Parent members of learning committee were posted on the website. A link to the info was included in the ding letter. Wow to the poster who thinks the people chosen for the committee are gullible, don't show up and advocates for new facilities. Did it ever cross your mind that perhaps many highly qualified people put in applications? Maybe the criteria was to have an open mind and not be judgmental. Why insult your fellow parents who most likely share many of the same concerns you have? Perhaps you should withhold judgement until you have something tangible to criticize. Don't blame your sour grapes on BOE hi-jinx. I thought one of the tenets of this blog was to not attack people, especially fellow parents who haven't done anything to deserve it, other than get chosen for a committee. I thought the blog monitors were watching for this type of attack. I agree 6:54. Sounds like sour grapes to me. Maybe some of the parents not chosen (not you, Jill) have shown an inability to listen and/or be respectful of others and/or consider viewpoints other than their own which prevented their selection. Just because a parent doesn't feel comfortable speaking publicly at a meeting or agree with everything the bloggers have to say, doesn't mean they are gullible, uninformed or uninvolved. It is that sort of condescending and egocentric attitude that has caused so many problems for everyone involved with these issues. Come on people, give this a chance to work and stop waiting to pounce on every little thing. Surely none of the current members of the board of education / staff would be so thin skinned as to pass over well qualified parents that might be critical of prior actions. It will be interesting to see how the district level staffing decisions to replace departed employees reflect on Dr. White's approach to finding personnel that share his views / bring a diversity of experience to their role. It is nice that the web page for the learning committee includes the full list of parents selected; that information is not published for the other superintendent's committees (facilities, finance) maybe not a major sea change but at least a step in the right direction. I have been very critical for many years and I was chosen. I really believe it has more to do with attaining a variety of school representation, age of children and academic ability/needs of children than anything. And they may be looking for fresh and different perspectives, or to hear from new parents, as well. I agree, though, that if some of the parents haven't been involved with these issues, they will have a steep learning curve which, hopefully they are willing to take on. I don't believe they would choose a teacher from another school district, Jill. And let's not forget, parents represent a minority role on this committee. We are not decision makers and that is as it should be. I have been very outspoken and I was included. I do feel badly that I was chosen and so manly highly qualified parents were not. I wish more parents could have been included. As the school year comes to an end (teachers were in attendance yesterday for an In-Service Day) and most D181 constituency groups head off for a summer of fun and relaxation (we hope), we thought it appropriate to revisit the Attendance Record of our elected Board of Education members, who along with the Central Office Administrators, are tasked with year-round responsibilities. We have updated the Board Member Attendance Page after each meeting, so you can all open the link and see for yourselves what we are about to report below. (Click to open link.) For purposes of an equal comparison, our critique below (with the exception of Nelson who we have more to say on) is based on the attendance record over the last 32 meetings, starting with May 6, 2013, when Ms. Garg, Ms. Vorobiev and Mr. Clarin were sworn in. We applaud Ms. Garg and Ms. Vorobiev who lead the board members in attendance. They personally attended 97% of the meetings, missing only one. They have fulfilled their obligations to the community that elected them. Thank you. Following in close second is Mr. Clarin, who personally attended 94%, missing only two. Keep up the good work Mr. Clarin! Tied for third place with an 88% personal attendance rate are Mr Heneghan and Mr. Yaeger. Mr. Henghan was absent for 2 meetings and present only by phone for 2. Mr. Yaeger was absent for 4 meetings. In fifth place is Mr. Turek, who personally attended only 81% of the meetings. He was absent for 5 meetings and present only by phone for 1. We expect better attendance from the Board President. SHAME ON Mr. Nelson! He has let his electorate down. He has not fulfilled his obligations. In fact, his attendance record has actually gotten worse in the last year, compared to over the last 1 1/2 years that our attendance chart tracks. The chart started with the 1/14/13 meeting and spans 41 meetings. He was personally in attendance for 41% of those meetings. He was absent from 32% and participated only by phone for another 27%. This downward attendance trend shows that he has "left the party." Time for him to do so officially and resign, in order that a truly committed community member can fill his seat and work with Dr. White's administration and the other board members who actually want to show up and do their jobs. According to the Hinsdalean preview of D181 board meeting topics, the spring MAP results will be presented at Elm School, 7 p.m. on Monday night, June 9. It should be interesting to see if the Administrators in the Department of Learning: Schneider, Russell, Igoe and Benaitis (all now under the supervision of Dr. White) will provide an honest version of what the results truly mean, or if the customary spin machine will be in operation. Judging by the MAP results from our own children and from what we have already heard from parents, the administration has some explaining to do regarding the impact of Learning for All. Over the weekend the D181 Board of Education published on Board Docs all of the administrators' contracts it approved on May 29, 2014, as well as the Personnel Agenda listing their salaries and length of the contracts. We have had a chance to review all of these documents, calculate the percentage increase in the salaries, as well as analyze the terms of and inconsistencies found amongst the contracts. Below, we will discuss the "highlights" and raise concerns and questions we have with the contracts. We begin by stating that in our opinion, we unequivocally believe that the BOE has shown a complete lack of fairness and equity in approving inflated raises for most of the administrators for next year, when compared to the CPI base raises given to the D181 teachers for next year. Further, in our opinion we believe the board has shown a lack of fiduciary duty to the D181 taxpayers by approving multi-year contracts for 6 administrators that are effective 5/30/14 (during the 2013-2014 school year). We also believe the BOE has shown a careless disregard for the interest of the community in approving multi-year contracts for two central administrators, Dawn Benaitis and Gary Frisch. And finally, we believe the BOE has once again sauntered down a dark path sorely lacking in transparency. Click to open 5/29/14 agenda item with links to each contract. Click to open Personnel Agenda listing 2014-2015 salaries for 1 and 3 and 4 year contracts and 2015-2016, 2016-2017, 2017-2018 salaries for multi-year contracts.